Using copper as material in home decor and interior design has been gaining in popularity during the past year. Its metallic quality of light reflecting surfaces and copper orange tones has been made attractive in modern as well as rustic designs. It’s now very often used, especially when it comes to minimalist decor. But the new trend that we’re talking about is DIY copper decor. While we’ve experimented with copper decor pieces throughout the year and beyond, it is now time to get our hands dirty with crafts made from this material. Here are 16 brilliant ideas to get us started. There’s no better way to start with a new DIY project than a planter or a vase, especially when it comes to experimenting. 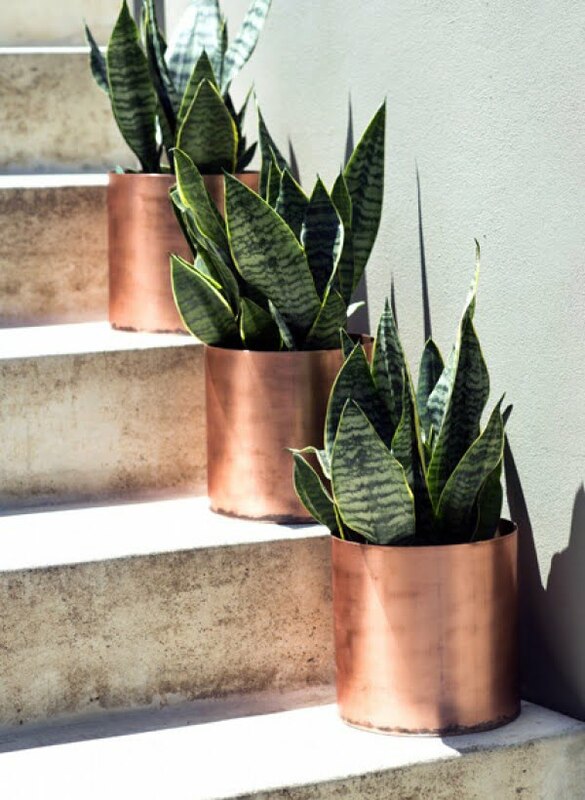 Make these lovely copper planters for a rustic meets modern decor. While copper is trending, it doesn’t mean you have to use it all over the house, even if you like the material so much. It actually looks best if used sparingly in small accents, such as these suspended wall shelves. 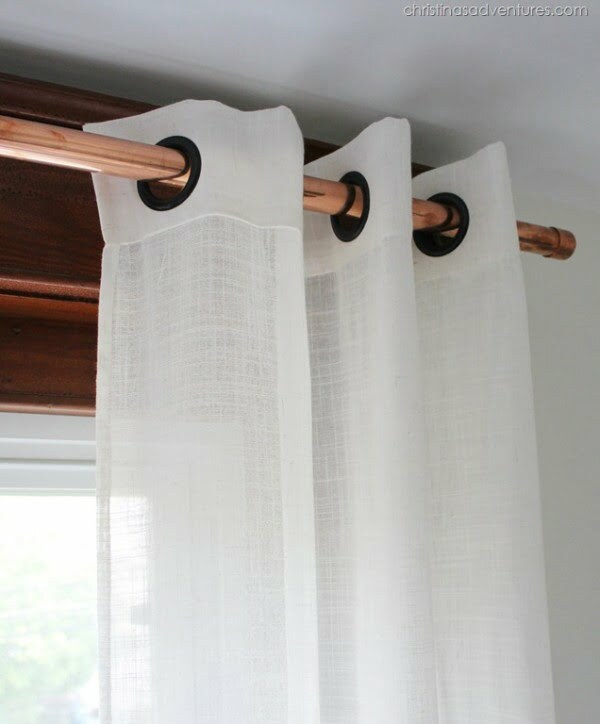 Another great idea where you can add an accent in copper is the curtain rod. It’s quite unexpected and adds a lot of decor interest in a subtle way. It will help your curtain styling as well. We love storage units, especially if they have decor value. Making a clothing rail from copper pipe certainly adds a lot to your decor. If you want to add just a little bit of copper to your home decor without changing much, try very small accents, such as these copper fridge magnets. A wine rack is an item of luxury which always adds some class to any decor. 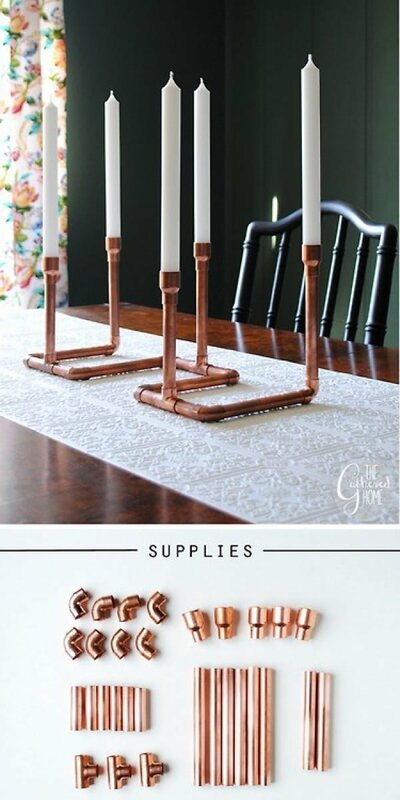 Making it with copper pipe brings a new classy item to your home. If you like rustic style more than you do modern, something made with wood will be your thing. Mixing these two materials (copper and wood) makes a winning combination of rustic and modern style. This wood slice side table is as rustic as it is whimsical. And again, we can see how modern qualities of copper play well with rustic warmth of wood. We love functional design and this laptop table is a brilliant example. You can use this table anywhere at home where you want to sit down and get some work done on your laptop. This item has so much decor value as well. Copper accents throughout the house add that modern trendy touch. Copper pipe pulls work especially well with dark, black or navy blue cabinets and dressers. Another great way to add copper to your decor is a DIY lamp. Just a few pieces of copper wire will make a great frame for a lampshade. We like whimsical decor and this copper pipe wall planter contraption is certainly whimsical or even quirky. It certainly makes the perfect focal point of room decor. Speaking of focal points, a pendant light or a chandelier always makes a great center piece in living room decor. Making it from copper emphasizes it even more. Making small adorable copper succulent planters is another brilliant way to add some copper to your decor. In the home decor community copper is known as the new gold and for a good reason. It’s becoming the new go-to material for classy and luxe items such as a candelabra for a fancy dinner. Your table centerpieces and decor items need this. 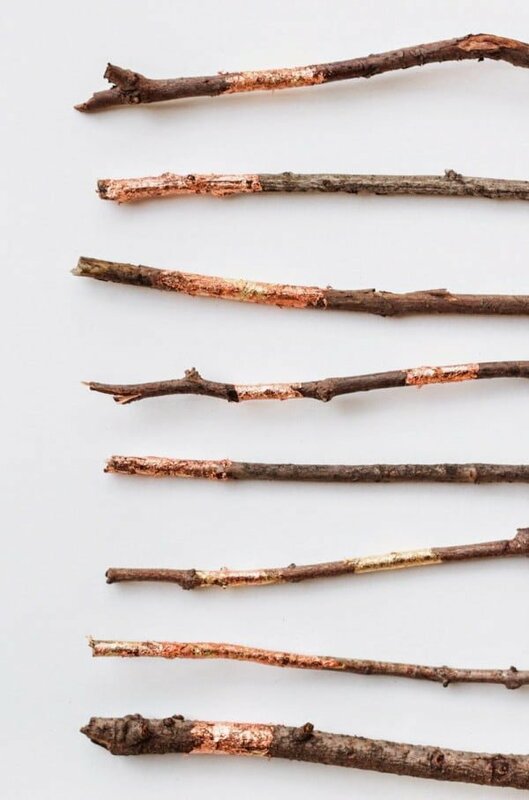 Add some branches embellished with gold and copper foil for some stylish bling.